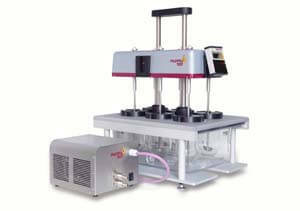 The PTWS 100 dissolution tester is a bench saving 6-spindle, lift-up, staggered stirrer start Dissolution Bath which offers 6 stirred positions, self-sealing and centring vessel covers, touch screen operation, audible signal for operator information, testing method filing system, and vibration free water bath assembly. The PTWS100S and the PTWS100D dissolution tester are designed in complaince to the valid USP <711/724> and EP <2.9.3/4> Pharmacopoeia. This instrument may be used also for automation. The standard supply scope includes batch coded glass vessels (1 litre), coded mono stirrer shafts with attachable stainl. steel adapter with paddle blades (basket, TC etc. optional), stirrer depth and centring gauges. The 3by2 or 2by3 arrangement of the vessels reduces the footprint to approx. 45 cms. Using the PTWS100 dissolution tester within an automated system offers the operator full access to the vessels before and at the end of a run as the complete drive housing is lifted upwards electrically, assisted by the centre-drive head lifting assistance. Manual and automated sampling is done through vessel covers with special holes to allow the PT-MDS Manual Sampling System or any tubing installation to pass. The special design, in which the blow-moulded single piece water bath is placed to the instrument’s chassis and the separated heating system, virtually eliminates any vibration transfer from both within the instrument. Inside the Heating Box even the built-in circulation pump is spring loaded for absolute vibration free operation. For easy and fast maintenance the pump and mains power entry are placedinto a separate housing. Pump, Heater, Sensor, Mains Supply Board are accessible without to move the bath off its position. This saves you the necessity to do a USP Suitability Test using RS Tablets after instruments maintenance. Each stirrer shaft may be started to rotate inside the vessel after the tablets has been introduced either individually or common. The PTWS100D is supplied with a single DC motor drive while the PTWS100S includes individual stepper motors for each one of the 6 stirring stations. It is also available as a 2 litre version. Other instruments of the Pharma Test dissolution instrument series are the PT-DT70, PTWS 310 for 1 and 2 litre vessels, PTWS610 (6+2), PTWS1210 (12 + 2), PTWSD610 (dual drive 6+6), and the 5 ltr. vessel instrument type PTWS4000.